After missing out of the last two editions of Africa’s biggest soccer fiesta-Africa Cup of Nations, Nigeria will today start another journey towards qualifying for the biennial competition slated for Cameroon in 2019, as the Super Eagles host the Bafana Bafana of South Africa at the Godswill Akpabio Stadium, Uyo. Nigeria which won the 2013 edition of the AFCON, hosted in South Africa have struggled to stamp its authority on the continent in spite of the arrays of stars at its disposal. As part of Nigeria’s preparations towards the encounter against South Africa, Eagles have camped in France and played two friendly matches-a three-nil bashing of Togo and a 1-1 draw against Corsica. In a chat with THISDAY, for national team Captain, Segun Odegbami, said it was a shame that Nigeria in spite of its richness both natural and human could fail to qualify for an African competition when the country should actually be looking beyond the continent for successes. “It is abnormal and totally unacceptable that one of the richest countries in terms of natural talent of football, a country with our resources-both natural and human, a country with our size in population, a country with deep rich history in football should not be at any Africa Cup of Nations. “It is a totally unacceptable thing, so we should all cover our faces in shame that for the past two editions of AFCON, Nigeria was not there. We have absolutely no excuse,” Odegbami said. Continuing, the “Mathematical” Odegbami as he was popularly called during his active days said, “Saturday (today) is another opportunity, it is another time for us to remember who we really are. South Africa cannot stop us. No country in Africa should be able to stop us from going to the Nations Cup, particularly now that we have more countries participating in the competition. It’s not like when only eight countries were participating. We have developed a lot. We have the largest expatriate of players playing in Europe from Africa. “I see this as a time of recollection, a time of regrouping, a time of rebuilding to see what Gernot Rohr has put together as a national team, which has been encouraging since he became the Super Eagles coach. We will all be witnesses to the march towards the Africa Cup of Nations in 2019”. Meanwhile, Super Eagles coach, Rohr has set his sights on a win over South Africa, though he acknowledged that the clash with the 1996 AFCON champions will be tough but is hoping to mastermind a win for Nigerian over their bitter rivals. He also spoke about his delight at the choice of the Godswill Akpabio Stadium, Uyo venue of the game. “Yes, we are happy to be here in Uyo. We like this place. We won our last two games here so I hope this will be a third victory. If Nigeria qualify for the 2019 Africa Cup of Nations, It will be a fantastic adventure. “We were only spectators at the last again in Gabon and now, we want to be there also. We will start on Saturday (today) against the best team in the group. They have not lost a game in the last two years, since 2015 and I hope we’ll be able to do it”, Rohr said. In a show of intent, Ogenyi Onazi also declared that featuring at the 2019 Africa Cup of Nations and the 2018 FIFA World Cup finals remained the major target of Nigeria. The 24-year-old midfielder believes that the current crop of Super Eagles players can take Nigeria to the next AFCON in Cameroon and then to the World Cup in Russia based on the display of confidence and ambition in camp ahead of the game against South Africa today. The Trabzonspor man has also made it clear that the Super Eagles were ready to face South Africa’s Bafana Bafana today. “It is a big game, and we are one for the big occasion. I have confidence in the group that we have now and the ambition oozing in the camp. We want to go to the World Cup and the Africa Cup of Nations. Starting well on Saturday (today) will be key to our aspiration”, Onazi said. He also sees the opportunity to play South Africa in the Afcon qualification a chance to make amends for the past when they failed to qualify for the 2017 Afcon in Gabon. Ahead of the match, a former Super Eagles midfielder, Friday Ekpo in a chat with THISDAY said he expected the Super Eagles to win well. “I expect the Eagles to win well, so as to make the second leg in Johannesburg a formality. 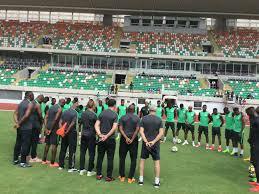 After missing out in two editions, we have no choice than to start very well”, Ekpo said. Ekpo however said the 2-2 draw the Bafana Bafana recorded in Uyo the last time the team played against Nigeria would boost their morale. “The last draw they got here would definitely boost their confidence”, he noted. The Bafana Bafana landed in Uyo on Wednesday, boosted up by their new manager, Stuart Baxter, who once led the Bafana charge, and hoping to reproduce the magic of November 17, 2004 in Johannesburg. Two of his key players in achieving this will be Itumeleng Khune at goalkeeper and Dean Furman in midfield, both of whom he had already identified as the kind of battlers he needed for the big game. While Khune’s experience and skill need no explanation, some may raise eyebrows at Furman, certainly not in Nigeria where the mercurial midfielder has always performed amazingly against them. Sure it may have been Rantie who circumvented Enyeama twice on the way to scoring a brace in November 2014, but it was captain Furman who sealed the Bafana middle and turned it into a sticky mouse-trap for the likes of Emenike, Musa, and Ikechukwu Uche, expelling them from the Equatorial Guinea AFCON. A year later it was Furman again at the Mbombela Stadium who spearheaded the South African defence against Nigeria by playing deeper than normal and again clawing out a 1-1 draw. Furman is feisty and isn’t pushed off the ball. His tackles are mostly on point and at six feet he isn’t easily beaten with the lob unless it is weighted perfectly. With Mikel Obi out for Nigeria, it will be interesting to see how he fares against the talent-overloaded Nigerian midfield that Rohr is still tinkering with. Considering that the Sparrow Hawks dominated the Eagles (despite losing 3-0) in their last friendly in ball possession (52 v 48 per cent ) the table is set for an exciting duel as Nigeria are still not playing coherently in this part of the field. Dial up the knob on drama since the Eagle’s Onazi – most likely replacement for Mikel as midfield General, plays with as much temperament as Furman.